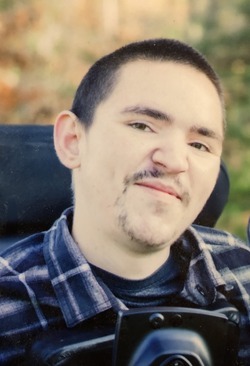 BROOKLINE, NH - Tyler J. Ricard, age 24, passed away on Saturday, August 25, 2018 at Lowell General Hospital, surrounded by those he loved, after a long courageous battle with Duchenne Muscular Dystrophy. Tyler was a avid motorcycle enthusiast and enjoyed building them with his dad. The Tyler Ride was a big part of his life for the past 19 years and loved seeing those that participated with their motorcycles every year. He enjoyed yearly camping trips to Florida with his family and going to the ISMA races. He also enjoyed video games, computers and keeping in touch with everyone through social media. Tyler enjoyed life and was an inspiration to all that met him. ARRANGEMENTS - Family and friends are invited to honor and remember Tyler on Wednesday, Aug. 29 from 4 to 8pm at the J. A. HEALY SONS FUNERAL HOME, 57 N. Main St., WESTFORD. His Funeral Mass will be celebrated on Thursday morning at 10 o'clock at St. Catherine of Alexandria Church, 107 N. Main St., Westford. (The family requests those attending Tyler's Mass to go directly to church). Interment to follow at Pine Grove Cemetery, Brookline, NH. In lieu of flowers, contributions in Tyler's memory may be made to the Make A Wish Foundation at www.wish.org/donate. To share your thoughts and memories of Tyler, please click the sign guestbook link.